Jukto Front leader and Bikalpa Dhara chief Badruddoza Chowdhury has urged the Election Commission (EC) to exercise its full authority to ensure a credible national election. “We’ll join the election, but a level playing field must be ensured for all,” he on Saturday (Nov 10). 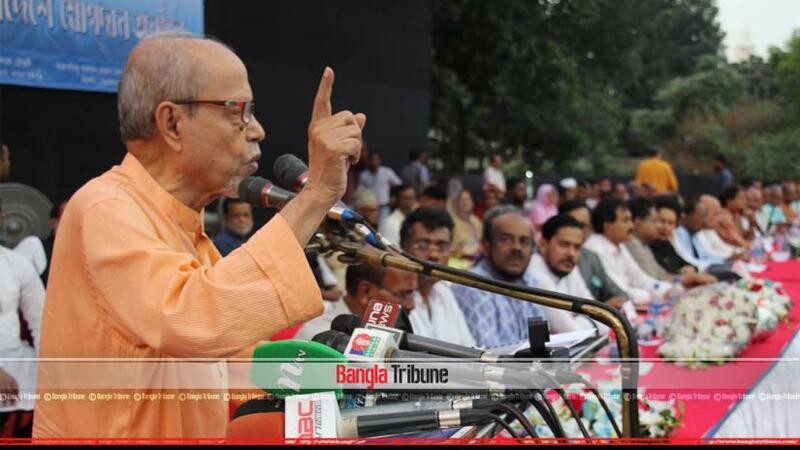 Speaking at a rally in Dhaka, Badruddoza said, “The President and the EC must understand that those who are involved in the election process are no longer under the government. “So, the Commission must exercise its full authority. Otherwise, history won’t forgive them,” he added. Badruddoza, a former president, urged authorities concerned to ensure press freedom so that journalists can work independently and without any fear. He alleged that Bikolpa Dhara Presidium member Golam Reza’s motorcade was attacked at the capital’s Mirpur on its way to the rally he was addressing. From the rally, it was announced that Jukto Front and Bikalpa Dhara will take part in the election with ‘Kula’ (winnowing platter) symbol. At the rally, several parties including Bangladesh Sangskritik Muktijote led by Abu Layes Munna, Bangladesh Jatiya Party led by MA Mukit, Gano Sangskritik Dal led by Sardar Shams AL Mamun, Nationalist Democratic Front (NDF) and National People's Party (NPP)led by Sheikh Salauddin Salu and Bangladesh Sharia Andalon announced their allying with Jukto Front.